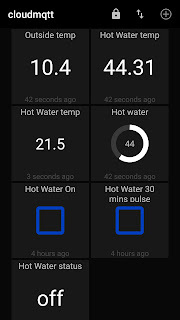 For quite a while now I've been meaning to put together a project to control the Hot water heating remotely from my phone, I all ready have a 2nd generation Nest to control the heating but don't fancy spending the money for the 3rd generation just to add the water heating function. 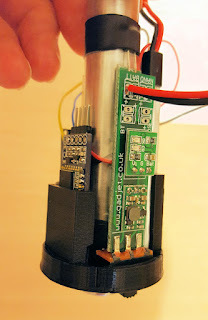 I started with the plan to use a Wemos D1 Mini with a couple of the plug-in modules like a relay module, processor module and a button module all placed on the dual base PCB. 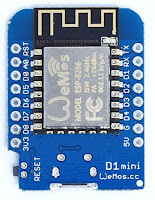 For those of you not familiar with the Wemos D1 you have to be aware of which pins the different modules use because the relay module uses D1 which also happens to be used for one the I2C pins so if you wanted to use the I2C OLED display module it would clash. 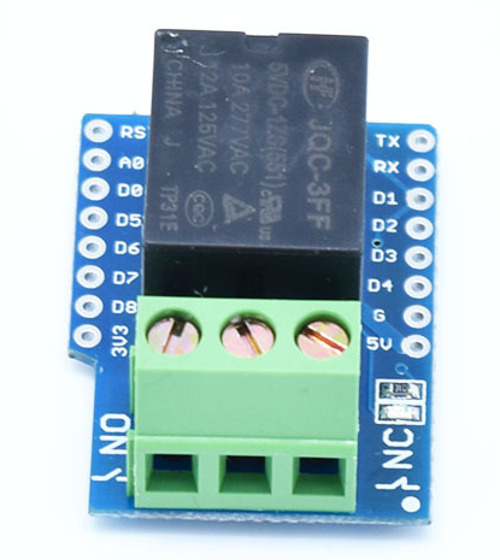 I decided to re-wire my relay pin to use D6 (GPIO12) as this is the default pin that the Sonoff / arendst software uses for the relay anyway. 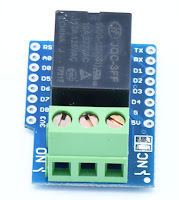 The idea was to load some software written by a chap called arendst on Github this software allows you to control a relay via MQTT, usually used in WiFi controlled power sockets found at ITEAD but there's no reason why it can't be used on any ESP8266 to drive a relay and more importantly read a connected temperature sensor like a DHT22 or DS18B20. 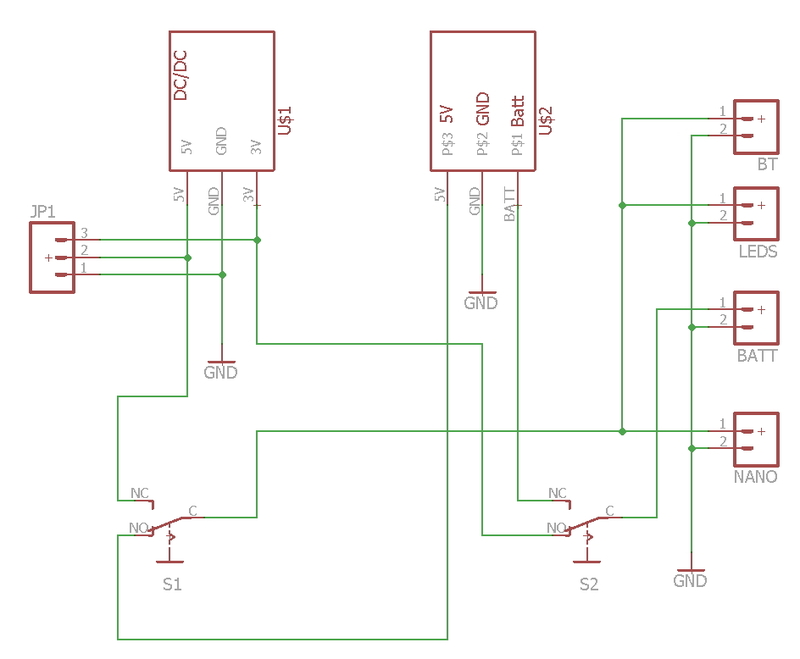 I planned to control this from my Raspberry Pi 3 running Node Red, I would design a control layout using the Dashboard module, which serves up a webpage I can view on my phone/PC/tablet etc. inside my WiFi network. but could also be controlled outside my network using an MQTT app on my phone via the Cloudmqtt service using 4G data. 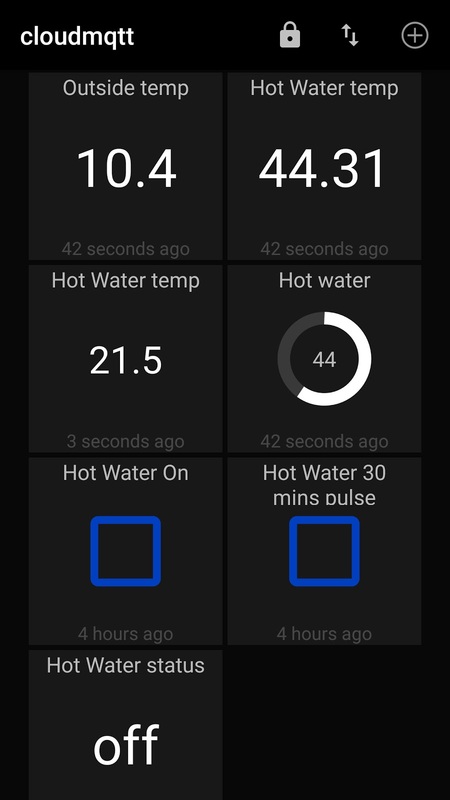 I also got hold of an Amazon DASH Button which I've configured using a node "node-dash-button", I've configured it so that pressing this button gives a 30 min boost to the Hot Water. 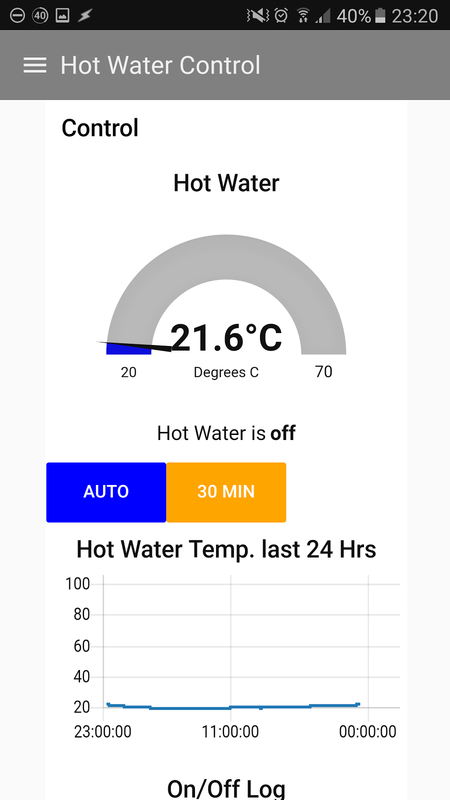 I tried several MQTT apps and found the one I liked the most was MQTT dash it let me create quite a nice interface. 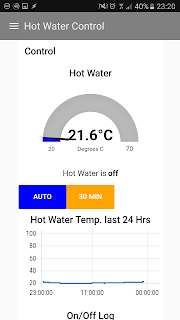 Another one I liked was MQTT Dashboard because this has widgets that you can have on you phone desktop to switch something on or off without opening the app first (Android only, I think). 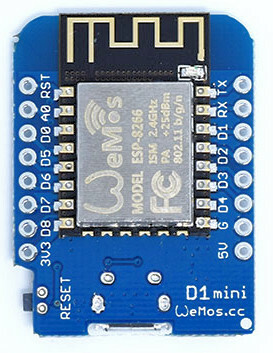 So all was going well and starting to work when I saw that the lovely people that make the Raspberry Pis had just launched a new version of the Pi Zero, this time with WiFi and Bluetooth included and it was just under £10 .....Whoa! .... hold on a minute! under a tenner! .... 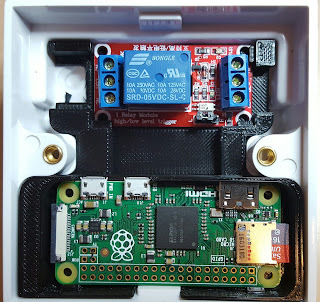 I'm quite prepared to use a Pi Zero W instead of a Wemos D1 mini and shut it in the airing cupboard controlling the hot water. The Pi Zero isn't very fast but I was certain it was plenty fast enough to control one relay and read the temperature using a DS18B20. So I changed plans at this point a turned toward the Pi Zero W, if you want to use an ESP8266 then go over to Github and use arendst's code (I use it on 3 Sonoffs) and make it happen. 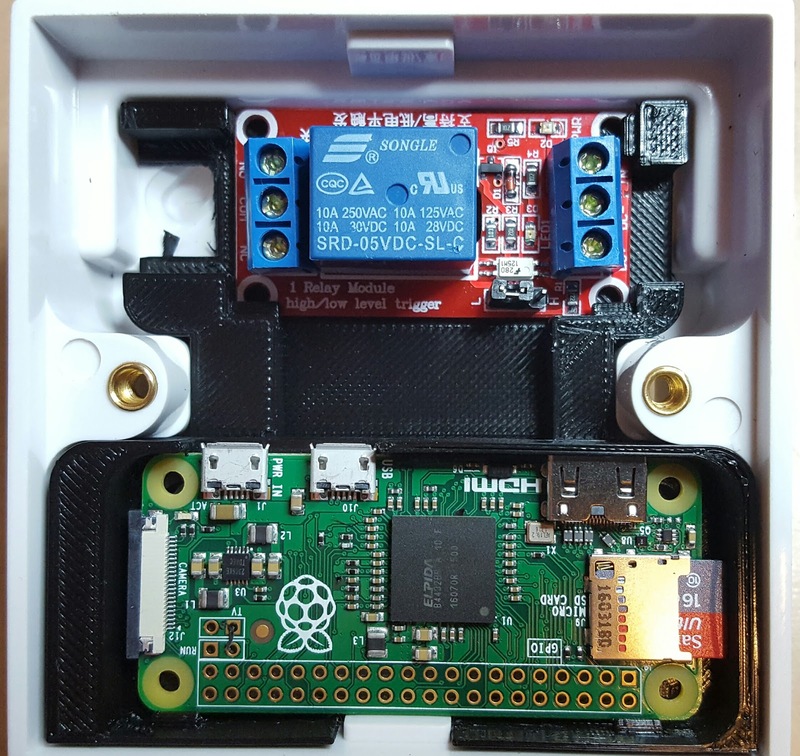 I will put together a blog entry for the Pi Zero W in a few days, I'm just sorting out the housing and wiring to put it in the airing cupboard. As usual if there are any questions just ask them in the comments and I'll do my best to answer them. 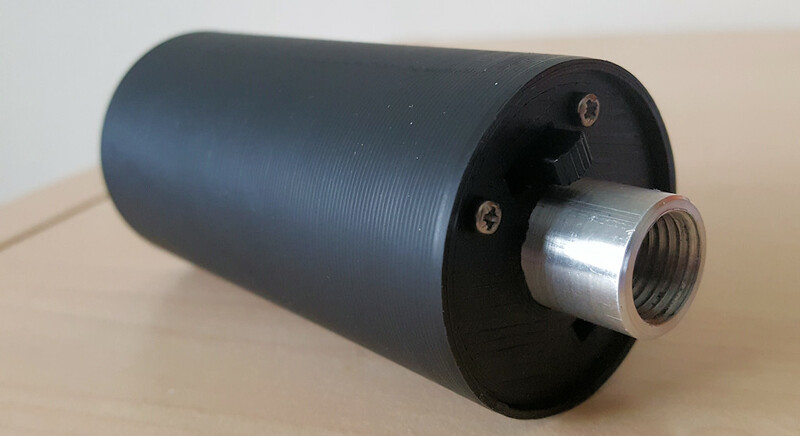 Well it's been a long time since I started off this project and I've made a few changes along the way and a few people have had a go at making their own Chronos based on the entries in this blog, some followed the design and some incorporated elements of their own into the design to improve it. The fact that it was not a round tube but a teardrop and therefore may not always line up with the rifle and look a bit odd. 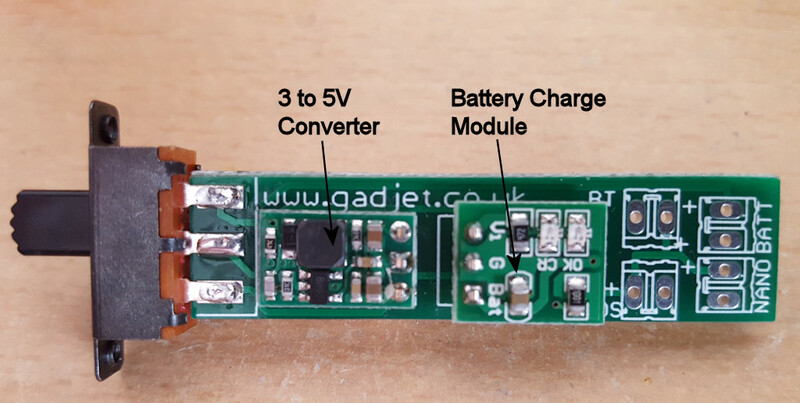 An external charger circuit was required to charge the internal battery. The switch was mounted at the other end of the tube from the electronics and was a bit of a pain to wire up and assemble. So along came the Mark II with the intention of improving on those issues. The main reason for the teardrop design was to fit in the electronic modules with the central tube so I needed to come up with a design where I could place the modules and battery around the perimeter of the tube whilst keeping the overall diameter as small as possible. I also wanted to add a charging circuit inside the tube so there was only one part to worry about so you could just plug it into a phone charger to charge it. 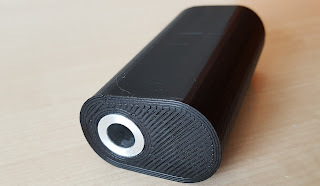 If I could get all this inside the tube, along with a switch located at the same end as the electronics then it would be a big improvement IMO. 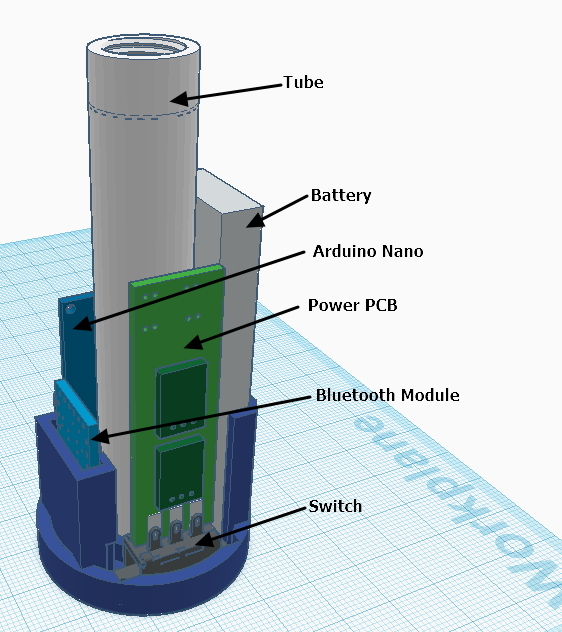 First test was putting the modules around the tube .... using Tinkercad I messed around with all the modules trying to fit them in. 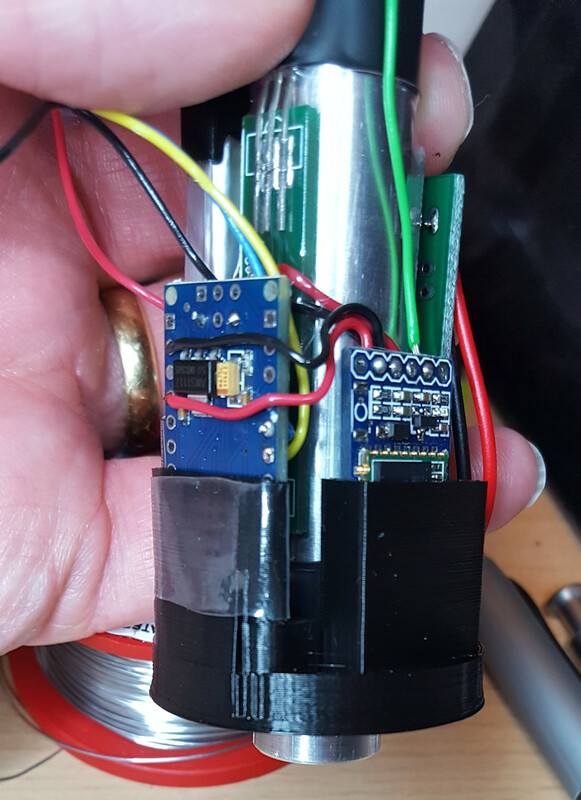 Having got them to all fit in a round base I set about figuring out the charging the battery and powering the Nano from the 3.6V battery as the IR receivers were specified to use 5V. 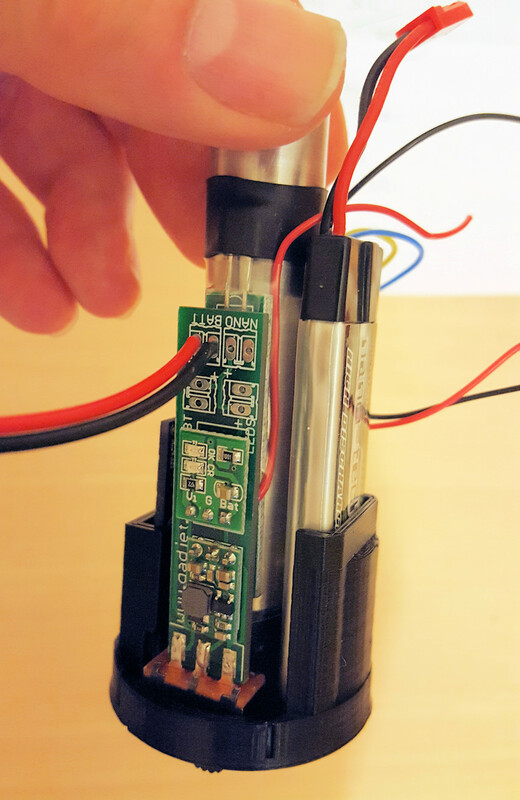 After a good Googling around for some modules I finally found some modules that fit the bill, one to convert 3.6V to 5V and another to charge a single lithium cell from 5V. 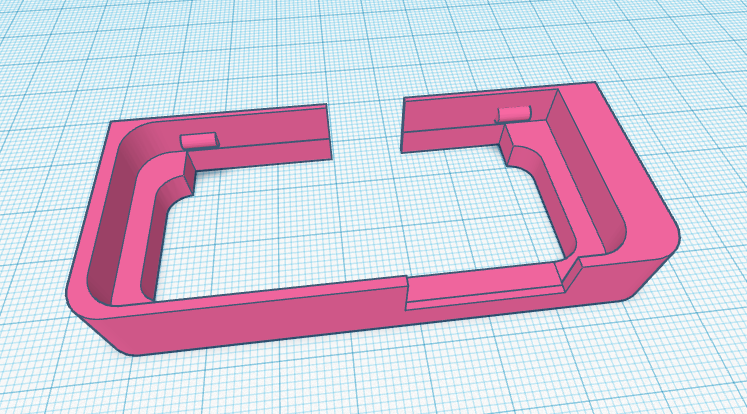 These module need to be pretty small and I wanted them to be on a single PCB to make wiring up the modules easy so I designed a PCB to mount them on and had the idea to attach the PCB to the switch which would be securely screwed in to the base. 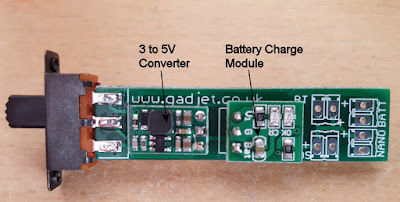 The outcome for this design means that when switched on the 3.6V battery is connected to the DC/DC converter supplying 5V to the Nano, BT module and the IR beams, when switched off the battery changes to the output of the single cell charger module, which gets it's 5V supply from the nano USB connector therefore charging the battery. 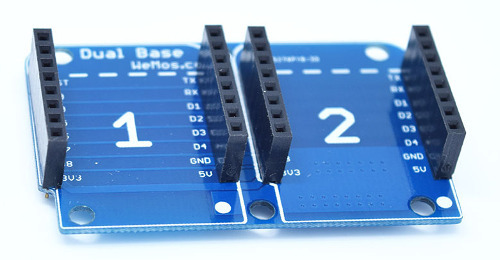 Also all the supply connections for the modules are also on the PCB making it easier to wire up when assembling. 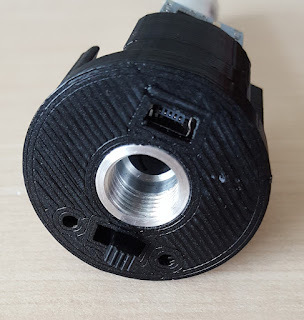 Mini Miniature On/On 6 Pin Slide Switch DPDT eBay Search Link ~£0.40 ea. 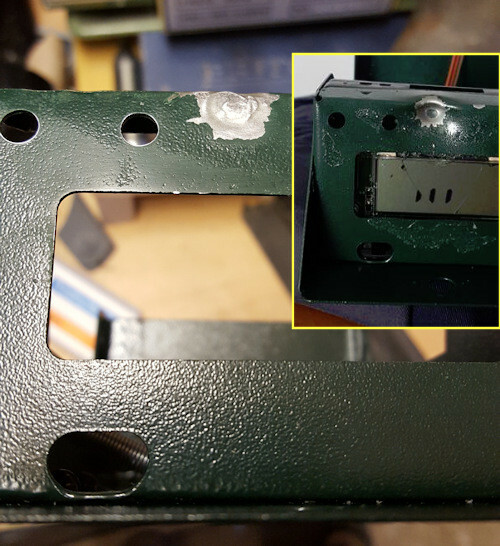 I recently bought a damaged Chrony F1 from a chap that had accidentally shot it, it never ceases to amaze me how companies can design and sell things that by design you shoot at and not put adequate protection in front of the delicate electronics. The front casing had been hit and had a large dent in it that cracked the LCD and dented the crystal body, after a suggestion from John on the Facebook group "SHOOTING CHRONOGRAPHS U.K." I looked at Radio spares for a replacement and bought this screen 184-7715, it worked like a charm and after a bit of panel beating and a lick of Hammerite Dark Green paint it looked as good as new. One other thing I did before shooting at it was to buy some 10mm Acrylic sheet from eBay to make some clear shields to protect the display and the rear sensor block. So when I started to use it I realised that I'd have to write down the readings and calculate the power myself later ..... s*d that! surely there's an app for that, if not I'll write one. So I created an app to record the readings after each shot with the option to speak the value if you prefer and automatically calculate the power using the pellet weight you entered. I also learned of a secondary Android market called Aptoide, to which I added some of my apps so they can be downloaded from one place. The link to my store is http://gadjetware.store.aptoide.com/ there are other apps there as well, if you think it's worth it buy me a beer using the beer icon :-) and I might add more features. 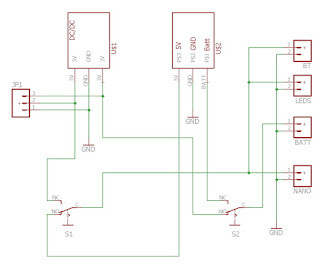 I found the serial communication protocol for the Chrony F1 and when I get a chance I'm going to look into adding the Chrony remote functionality to my PC software and maybe make a Bluetooth interface so your phone can talk to it. 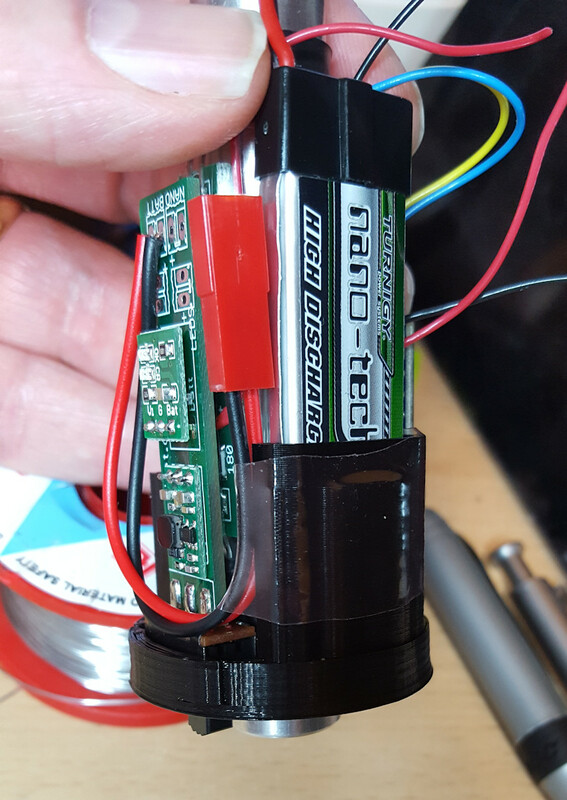 A few people have attempted the DIY chronograph build, at least one person improved the design and made an excellent version of his own. I had a a question asked about the accuracy of the chronograph so I setup some testing over the weekend to try and determine if it was as accurate as others out there. I don't have access to a calibrated air rifle or similar, if something like that even exists?? 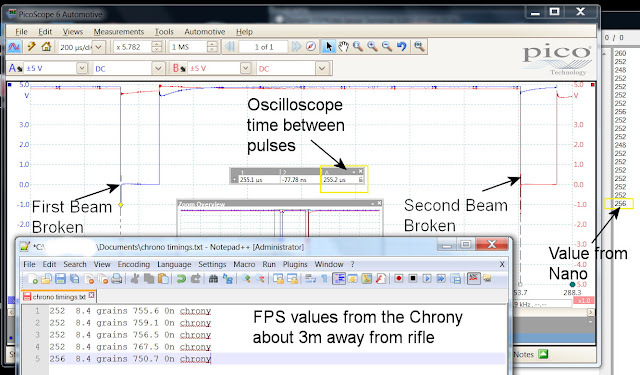 so I decided to use a good quality Oscilloscope (Picoscope automotive), which connected to my laptop via USB and do a comparison with the output from the Nano (in uSeconds). 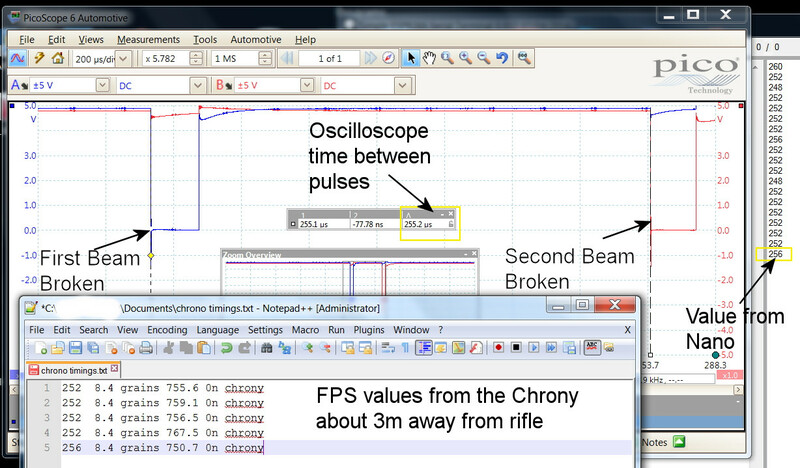 For each measurement I took a screenshot of the waveform from the Oscilloscope and the serial data from the Nano, this shows the correlation between the actual time between the first beam being broken and the second. There is also a google sheet showing the data that was recorded during the test here you can view the data and make your own decisions, for the last few shots I added a Chrony F1 about 3m away from the rifle to see what result that gave me. The Chrony was set up in the garage with the lights off (florescent's) because the Chrony doesn't like florescent lights, instead I had a couple of cheap battery powered LED lights on top of the diffusers. The conclusion is that although the data for each shot was different between the oscilloscope and Nano, over the 23 shots the average from both was exactly the same 10.57 ftLbs, this compares well to the 10.48 ftLbs when I had it checked at a shop a couple of years ago. 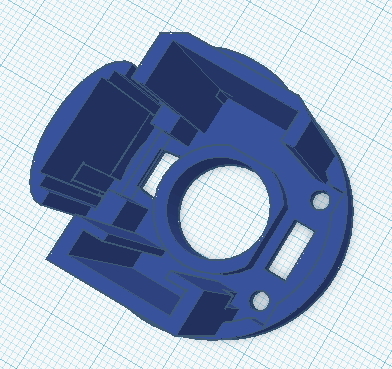 So I'm happy to use my DIY chrono with the understanding that there's always margin for variation and if I was getting 11.9 ftLbs that would be too close for comfort but 11.5 would give me 4% 'ish headroom. Just a quick update for anyone that has tried the PC software application for my DIY Chrono before, I've re-worked it a bit and changed the layout and moved the settings to a separate screen. Also now I've fixed the Combro option not working so it should now report the correct values, if not please let me know as I don't own a Combro ..... the whole point in making my own. The main screen shows all the shot details in FPS and M/S along with a min FPS, max FPS and a Delta FPS. On the right there is a list that adds each shot's data to a row so you can see the history. At the bottom is a chart section that, if the checkbox is checked, shows the data graphically, there is a tab for FPS and one for energy. You can also select the option to store the shot data to a file on the PC, the path is set automatically but you can type in your own. The data is stored as a CSV file and can be opened by excel and used to create a graph. You can set the PC to give you an audible warning every 'n' shots, this is good for knowing when you fired your last shot and you're not looking at the screen, the other check box resets the shot count after the beep. You can download the file from here unpack the rar file and run the setup to install. Comments and feedback always welcome and if you like buy me a pint with the donate button. After printing the last model I ran out of the white filament and decided to give the black filament a try and was surprised to get a print that looks and feels a better print, I think it's an optical illusion though, black just seems to look better. 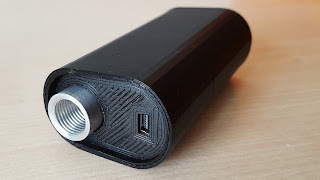 Anyway I decided to do another design of the enclosure one without the battery for those that just want to connect to their laptop via the USB cable and us the PC software from elsewhere in my blog. This design is a bit smaller that the first as there is no battery, switch or charging cable, I did leave in the holder for the Bluetooth module so it can be used with the smartphone app but you will need to power it from one of those portable emergency batteries via a USB cable. I've also been making some changes to the Arduino sketch to improve the functionality, I've implemented the use of interrupts to trigger the measurements so that some other things can be done via the main loop like checking if the trigger beams are blocked. Some other options may be possible like adding and SD card to store shot data internally and use you PC later to recover the shot data for analysis, If you use a long enough piece of aluminium you could add a thread to the end to fit you silencer to and just use you gun for the day and download the shot data later.